I am having trouble finding just the right beads for a project. It is a bag I am working on. I went to a couple of bead stores and didn’t find anything. Then I went to Micheal’s. I didn’t find any beads, but I found some navy blue size 8 pearl cotton. Then I tried JoAnn’s and found these beads. Perfect I thought. Well I was wrong, they made the design of the bag seem really tacky. So I have ordered another style to try. In the meantime I played around thinking maybe these beads would make a cute handle for a jean bag of some sort. That is a possibility. I am also thinking that maybe I’ll just crochet a long beaded rope and wear it lariat style in some way. The pearl cotton is so soft that the beads drape nicely. It is kind of fun to play around with the slinky feel of the bead work. I used two strands of the pearl cotton which I keep tangle free in a zip-lock bag. Also I am using a size 00 steel hook. From each container of beads I am getting 10″ of rope, which is 4 beads in the round done in slip-stitch crochet. 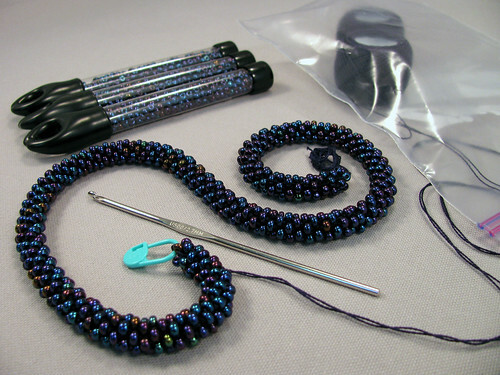 The strand in the photo has two containers of beads, so is 20″ long. To add more beads, I will cut the threads and string the rest of the containers. The knot will be easily hidden since very little of the pearl cotton shows. Now instead of finishing one project, I have two unfinished ones. With a fiber art journey when the path becomes a fork it is nice that we can take both roads. It just takes a little longer. This entry was posted on Tuesday, November 18th, 2008 at 3:00 am and is filed under Crochet. Tagged: Beading, Crochet. You can feed this entry. You can leave a response, or trackback from your own site.